This book was an unexpected pleasure. I purchased it in the UK over a year ago at this amazing bargain bookshop that I found, and which has now closed. I’ve been putting off reading some of them because one of the first books I read from there was terrible and is one of the few books I’ve given away. With this book, on the other hand, I got a great deal! The book follows the tale of two people, mainly, Francis Quoynt and Kate Peach. They were lovers before Francis left Kate a ruined woman two years before the novel’s beginning. 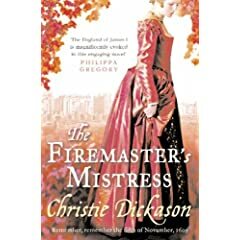 Kate has had to do all that she can to survive, while Francis has been at war for England as a firemaster – someone who makes gunpowder and sets off “controlled” explosions. Not surprisingly, as the country’s premier firemaster, Francis is sent to London and ordered to ingratiate himself among a group of men who plan to kill the king. This is the famous Gunpowder Plot of 1605, and all the plotters aside from Quoynt are real historical figures. Francis finds himself involved with Kate, who is a secret Catholic like the plotters, and confusion ensues as he isn’t sure where his loyalties lie while she attempts to adjust to having the Quoynt family back in her life. I particularly enjoyed this book. It was well-plotted, though a bit slow in the beginning, and I was hooked only a little way in. I could really empathize with Francis and Kate because the author gave me a great perspective right into their heads. Even Francis’s father, Boomer, was done well. The subject matter is as ever interesting and I felt was handled pretty well. The only thing that dissatisfied me was part of the ending, which constitutes a spoiler. I did not like that Kate ended up with Boomer. After all of Francis’s effort, I felt that he really deserved the girl, especially when he loved her so. I couldn’t see their relationship at all, and this change marred what was a really good book. So, in the end, the quality of the book was quite good and it’s certainly up there with many other historical fiction authors, so I’m not quite sure why it was in a bargain bookshop! I’d recommend it to other historical fiction readers. In fact, I see it’s coming out in the US this September, so I hope Ms. Dickason gets more attention! I certainly intend to pursue her other works. In all, an absorbing worthy read. I agree with the ending. It was very unexpected and it did spoil the ending for me.